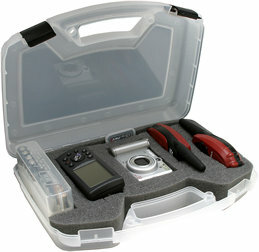 Storage and carrying case for GPS, two-way radios, compact cameras, electronic dog training systems...etc. Ideal for for around the house, in the truck or going threw airport security when traveling. Remember they do not let you lock your luggage any more when traveling by plane. The see-thur lid makes it easy to see if you put back the radio, memory card or transmitter. The SEC provides a three-layer foam set with a thick layer of �Pluck & Pull� foam. Just �pluck and pull� the foam into your ideal configuration for the ultimate in personalized storage protection. The clear, battery organizer holds up to 20 AA or 28 AAA batteries. Case is padlock tabbed to detour undesired openings. The case include battery organiser and three piece foam set. Color: Clear. Inner dim. 12.5" x 8.1" x 3.0" Outer dim. 13.1"x 9.7"x 3.2"